Carl Court / Getty ImagesThe cheerleaders must be taller than 5’3. 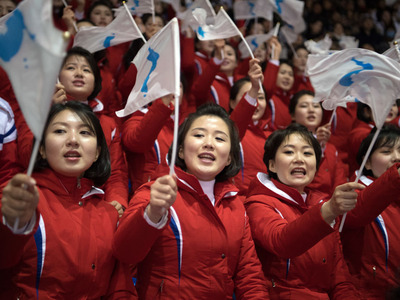 • The North Korean cheerleaders at the Winter Olympics have captured the world’s attention. 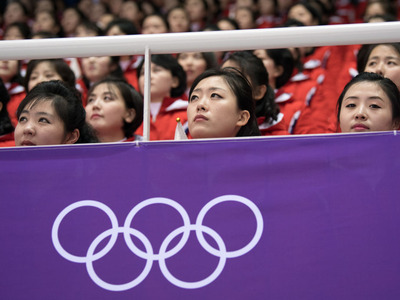 • They have also prompted criticism of what many perceive as the media’s overly-exuberant coverage of the authoritarian regime’s Olympic delegation. • The cheerleaders are all young women who’ve been hand picked based on certain stringent physical requirements. • The cheerleaders all go through an intense vetting process, to minimise the risk of defection. • Along with the North Korean athletes, they’re heavily guarded at the Pyeongchang Games. North Korea’s highly-synchronised, chanting squad of 229 cheerleaders has accomplished its mission. The large group’s coordinated cheers haven’t helped North Korea’s athletic prospects – they have yet to win a medal. But they did cause a stir in the media. 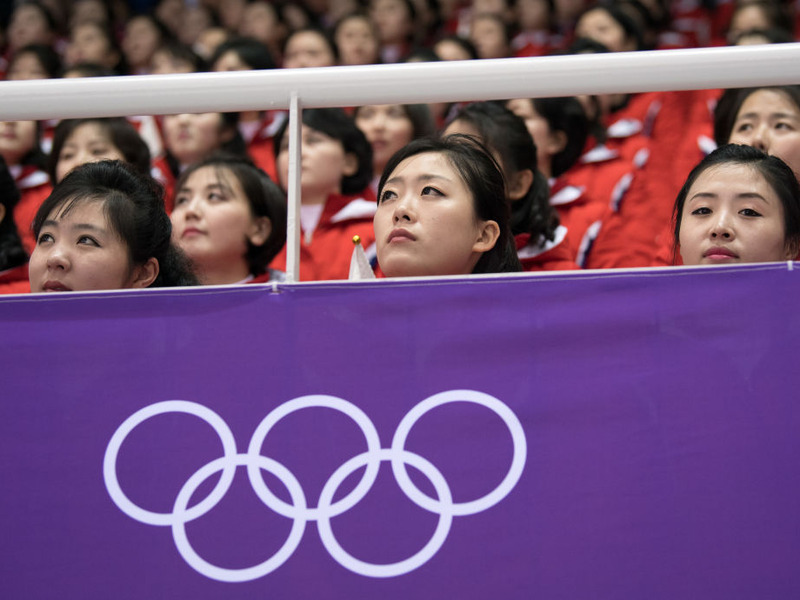 The press has received a lot of blowback for what critics see as its chipper coverage of North Korea’s Olympic delegation. Business Insider reported that a range of news organisations, from CNN to Reuters, were criticised for their “surprisingly cheery” reporting on North Korean leader Kim Jong Un’s sister – and propaganda minister – Kim Yo Jong. Fox News, The Washington Post, and BBC also received criticism for comparing Kim to First Daughter Ivanka Trump. And that dose of normalization may have been the goal for the North Korean regime, which has tortured, killed, and imprisoned millions over the years and has recently threatened nuclear war with the United States. North Korea’s “army of beauties” have certainly garnered much attention for their coordinated routines, Business Insider’s Jim Edwards reported. But, despite the cheerleaders’ matching smiles and upbeat chants, the individual members of the squad will likely be in danger if they slip up or attempt to defect. The gig isn’t a year-round job, and it’s not a paid position. The squad typically convenes for months-long training sessions before big events, like the Olympics. There are stringent physical requirements for joining. The cheerleaders must be taller than 5’3, and have a round face, large eyes, and clear, high voices. The squad members are all their late teens or early 20s. Former cheerleader Ri Sol-ju — Kim Jong-Un’s now-wife — was 16 when she performed with in the group in 2005. The prospective cheerleaders must also be able to pass a background check. Anyone with relatives who defected is automatically out of the running. The same goes for cheerleaders with family ties to Japan. Many of the cheerleaders are recruited from Kim Il-sung University, while others have moved up the ranks through other performing groups. North Korean defector and ex-cheerleader Han Seo-hee said she was first picked out to perform in an orchestra group at the age of eight. From there, she was ultimately recruited to join the cheerleading squad. The New York Times reported that the cheerleaders also view having the opportunity to travel as “a privilege” and a major draw. At the Olympics, the group’s performances function as blatant propaganda. 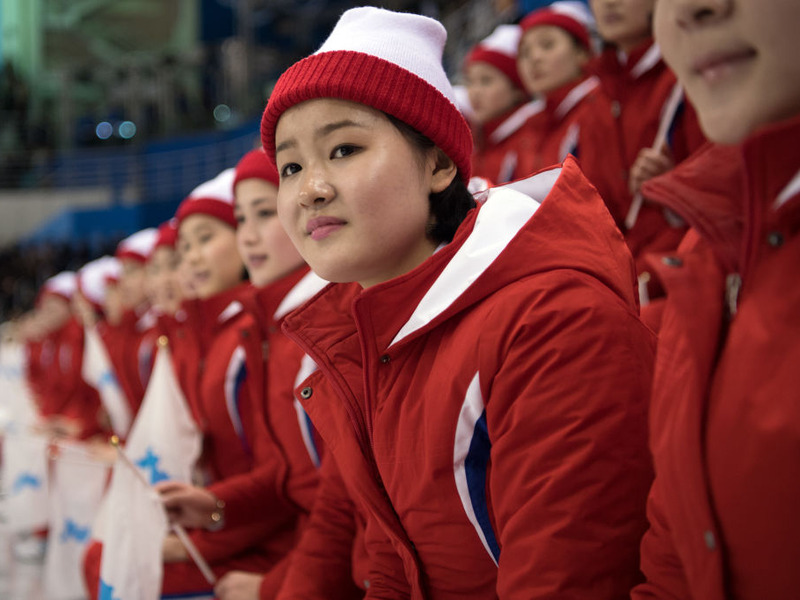 South Korea has put forward smaller cheerleading exhibitions, but for North Korea, it’s more about projecting strength than entertaining the crowd. Like the other North Korean athletes, the cheerleaders are never left alone. They must travel with both a South Korean and a North Korean monitor, at all times, and have to use the bathroom in groups. If any cheerleader gets out of line, they could be punished. In 2006, 21 cheerleaders were reportedly sent to a prison camp for discussing their trip to South Korea after they returned home. And defection is a nearly impossible prospect for the cheerleaders. The 500-person North Korean delegation includes numerous minders and informants. Their job is to surveil the athletes and cheerleaders, and ensure no one runs off. And, even if a cheerleader manages to get away, they’d potentially be condemning their family back home to imprisonment or death. North Korea’s propensity for collective punishment is actually why Han ended up fleeing the country. After her brother fled the country, Han and her parents knew that they might be targeted. They ultimately followed him into China in 2006.